The first time Debby Ramsey went out to sea, the ship encountered a big storm. Giant waves crashed around the small research vessel, and most people onboard got seasick. But Debby, who at the time had a master’s degree in physics, a Ph.D. in atmospheric sciences, and two young sons, was hooked. She is now third engineer onboard the Research Vessel Thomas G. Thomson operated by the University of Washington. Debby at sea with an iceberg in the background. For eight hours each day, Debby’s job is to make sure the ship’s engines, propulsion systems, refrigeration systems, freshwater-making systems, winches, galley (kitchen) equipment, and most things electrical—in other words, everything on the ship with moving parts—are running smoothly. If something does go wrong, she needs to figure out how to fix it. The R/V Thomas G. Thompson is a powerful ship. It has six diesel engines—three 2,100 horsepower engines that run the propulsion systems and three engines half that size that run the ship’s services such as the lights, computers, and air circulation systems. Usually only one large engine and one small engine run at a time. 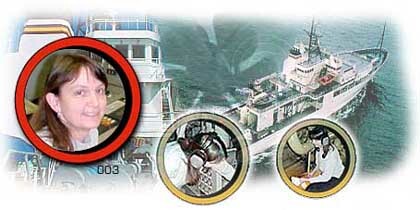 There are three propulsion systems—two motors in the back that propel the ship forward and a bow thruster in front that is used almost exclusively to maneuver the ship. The ship has no rudder. Instead, the rear motors, called Z-drives, have propellers that can rotate 360 degrees. The combination of the two Z-drives and the bow thruster enables the ship to make extremely tight maneuvers. Each cruise carries a third, second, first, and chief engineer and four oilers who assist the engineers. Debby works two four-hour shifts each day from eight to noon and from eight to midnight during which she and one of the oilers monitor the ship’s systems or work on maintenance. Debby enjoys the electrical work the most, so that has become her specialty on the ship. Debby checks gauges on the seismic air compressor system. Gauges allow engineers to monitor air pressures and temperatures at different stages of the compression process. Because there are so many safeguards built into the ships and the engineers and crew are so well trained, true emergencies are extremely rare. Debby has never had to face any dire crises, although she has had situations that required quick action. One time a pipe broke and filled the engine room bilge with 1,000 gallons of water. Another time a huge ball of krill blocked the intake of water used to cool the engines. Both problems were caught in time and easily fixed. With so much at stake, the U.S. Coast Guard requirements for getting an engineering license are rigorous. To qualify for third engineer, Debby had to take a physical exam, go through a background check (including fingerprints), pass first aid, CPR, and advanced marine fire-fighting courses, take a five-part written exam, get letters of recommendation from a captain and a chief engineer, accumulate three years of documented sea time, and fill out lots of paperwork. The license is honored worldwide and enables Debby to work as an engineer onboard any ship, even a supertanker. 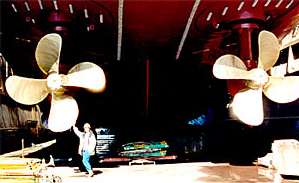 Debby stands next to R/V Thompson in drydock at Bellington Bay shipyard. Despite so many options, Debby is happy where she is. Even though she is out at sea and away from her family about six months each year and as much as two months at a time, four months of leave each year more than make up for that. She enjoys keeping track of what the scientists are up to and how the field of oceanography is progressing. She likes the people she works with and the freedom she has to pursue her interests and use her engineering skills. And of course she loves being at sea, even during the storms.